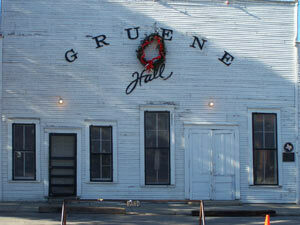 Gruene was settled in 1840 by German farmers and specifically Henry Gruene. The Gruenes built houses and planted the surrounding land with cotton, which became the number one cash crop and brought 20 to 30 more families to Gruene's lands. The first mercantile store was built in 1878 and shortly thereafter, a cotton gin powered by the Guadalupe River was added. Next a dance hall and saloon - Green Hall - was built and became the center of the communities' social life. 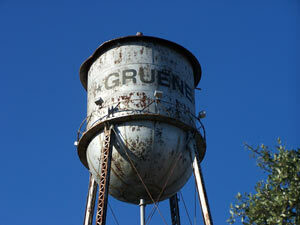 1920 marked the downfall of Gruene's development and good fortune. The original cotton gin burned down, the boll weevil attacked the cotton crops, and the Great Depression caused many of the businesses to fail and close, except for Gruene Hall which has never closed. 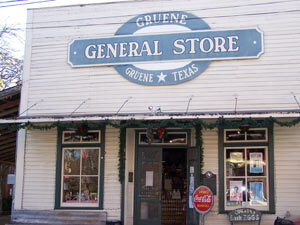 In 1975 most of the Gruene's estate was sold, the new purchasers began to establish new businesses, and Gruene was placed on the National Register of Historic Places. Today Gruene is a small but thriving community with residential areas, B&Bs, quaint shops, good restaurants, river outfitters, and our favorite, good ole Gruene Hall. The real reason we come to Gruene is for the music at Gruene Hall, which is still the center of Gruene's social life and it remains virtually untouched since its opening. The open-air dance floor, huge out-door garden area, wood-burning stove, and antique advertisements in the rafters are its distinguishing features. The Hall has been featured in numerous music videos and movies, of special note is "Michael" staring John Travolta whose dance scene was filmed at Gruene Hall. 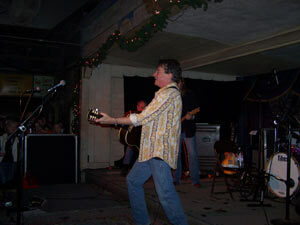 Gruene Hall has become well known internationally for featuring the best artists in contemporary country, blues, american, and folk. The Hall has been instrumental in starting the careers of Lyle Lovett, George Strait, Hal Ketchum, and many others. The stage has seen the likes of Bo Diddley, Willie Nelson, Garth Brooks, Merle Haggard, The Dixie Chicks, Pat Green, Jack Ingram, Cory Morrow, and Joe Ely, just to name a few. Anybody who is anybody in the Texas music scene has probably played at Gruene Hall - the front entrance is covered with pictures of musicians who have played Gruene Hall - and it continues to attract some of the best Texas musicians every weekend. 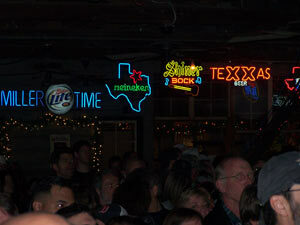 If you go to Gruene Hall, be prepared to have a good time with a fun crowd. There are three very good restaurants that Texas Outside can recommend - The Gristmill, Gruene River Grill, and Adobe Verde. The Gristmill, a huge refurbished old cotton gin overlooking the Guadalupe, has multiple dining areas with excellent outdoor patios and at times they have live music in their outdoor bar area. We really love Gruene River Grill for a smaller and cozier feel - try the library dining room with a fireplace or the great outdoor patio overlooking the Guadalupe. If it is still on Gruene River Grill's menu, the tilapia with cream sauce, the Caesar salad, steak gorgonzola, and the jalapeno corn chowder are excellent. Prices at both restaurants range from $8 to $20. Adobe Verde is ok for Mexican food and margaritas. Another reason to visit Gruene are the quaint shops that are loaded with everything from soaps and lotions to antiques and quilts. 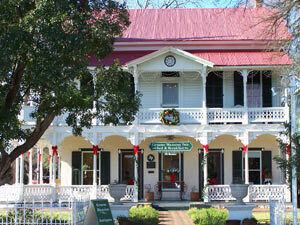 Most of the 15 or so merchants are in restored houses and buildings, some of which have been in Gruene since 1874. The Gruene General Store, which was selected as one of the 40 best places to visit, has a soda fountain, homemade fudge, antiques, and more in a nostalgic setting. 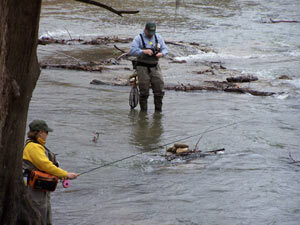 Gruene Outfitters has top of the line outdoor wear, footwear, and fly tackle as well as fly fishing lessons. The Grapevine offers wine tasting of some of the finest Texas wines, plus specialty beers, cigars, and gourmet gifts. Gruene has several accommodations for overnight trips - highly recommended if you spend an evening having fun at Gruene Hall or floating the Guadalupe. Next to Gruene hall is the 30 room which is a premier B&B that was Henry Gruene's original home home, carriage house, corn crib, and barn. 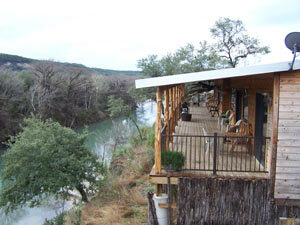 Some of the rooms overlook the Guadalupe river and all the rooms are very rustic and cozy. 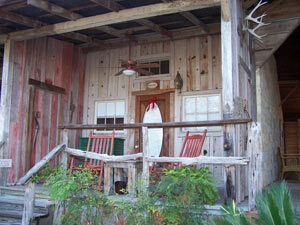 Antoinette's Cottage, owned and managed by the very charismatic Cheryl, is a 3 bedroom house a block from Gruene Hall. Antoinette's Cottage was the first house built in Gruene by Ernest Gruene in 1845. 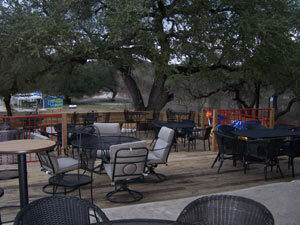 Another one the Texas Outside Favorites is Hideout on the Horseshoe which is about 10 minutes north toward Canyon Lake. This new resort which opened in 2006 sits on a bank overlooking the Hill Country and the Guadalupe River. Hideout is an outstanding place and worth your spending some time there. Rocking R, a couple blocks from Gruene Hall on along the Guadalupe has full hookups and tent camping. Gruene sits on a bluff above the Guadalupe river so make sure you walk couple blocks to the bridge that crosses the Guadalupe. Stop by Gruene River Raft Company for a cold beverage and sit on their patio and watch the tubers navigate the rapids. Rent a tube or raft from Rocking 'R' or Gruene River Raft Company - they offer trips for all ages and can even provide a professional guide. It can't get much better than floating down the Guadalupe River on a hot day with hundreds of your new found friends, as well as a spare tube loaded with beverages. If you're not interested in toobing, then enjoy the river with a refreshing swim, a hike along the banks, or drop a line and try to hook a fish (not a tube or tuber). Take a drive along river road 12 which crisscrosses the Guadalupe and some very scenic country. 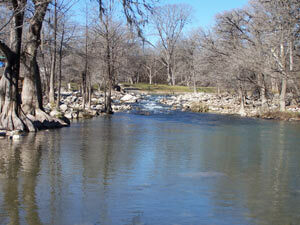 The river makes a 22 mile trip from Canyon Dam to Cypress Bend Park in New Braunfels. Along the way you will find breathtaking vistas as well as rapids and river features that draw float enthusiasts from all over the state - stop and enjoy the water. If you have a boat or want to rent one or a jet ski, head 10 minutes north to Canyon Lake which is one of the prettier lakes in Texas. You can party with the locals at Daisy Dukes, Dam Red Barn, or River Road Icehouse - all of which are fun and usually have karaoke or live music on the weekends.